A Simple Unit Converter 0.9.9.00 free download. A Simple Unit Converter - A Program to convert Units, Converts Many Imperial Units to Metric and back again. A Simple Unit Converter - A Program to convert Units, Converts Many Imperial Units to Metric and back again. It Converts Units in Temperature, Area,Mass, Volume, Length, Energy, Pressure and Time. 'Instant Converter' - an universal conversion program that converts units from time, length, area, volume and much more. US to Metric Toolkit is a Windows application that will convert common Metric units to US units back and forth. Converber is a unit converter. SwitchIt! 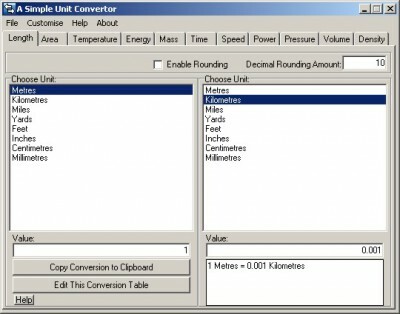 is a freeware application that allows you to easily to use unit conversion to convert the most popular units of distance, temperature, volume, time, speed, mass, energy and many others.